Rent a bike in San Francisco, and receive the value of your rental in store credit at Sports Basement, the city's biggest outdoor store, making your bike rental basically free! Choose either a 3-hour or full-day rental, and enjoy pedaling through the city's popular neighborhoods or head along nearby Marina Green and across the Golden Gate Bridge. A helmet, lock and water bottle holder are included. You have three days to use your credit at the sporting goods store, conveniently located at Crissy Field, on the way from Fisherman's Wharf to the bridge. 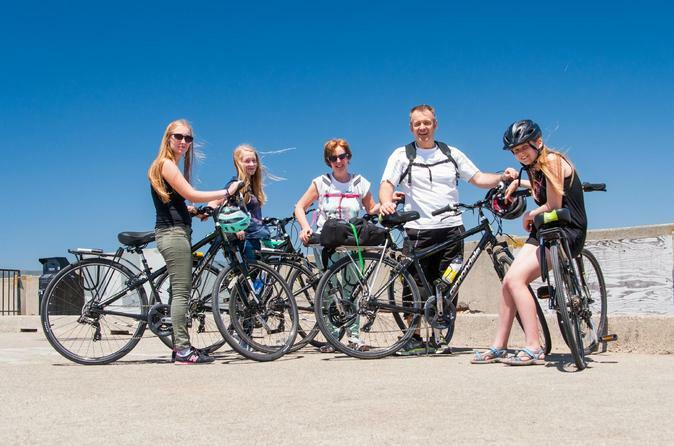 Pick up your bike at the rental shop located near Fisherman's Wharf, where you’ll be outfitted with a helmet, lock and the type of bicycle you selected when booking — a tandem or a Cannondale hybrid. Also when booking, select from a 3-hour or full-day rental period. Then set out to explore the streets of San Francisco, perhaps riding all the way across the Golden Gate Bridge to Sausalito, passing by Ghirardelli Square, Fort Mason, Marina Green and the Palace of Fine Arts on the way. When you reach Crissy Field, make a stop at Sports Basement, an 80,000-square-foot sporting goods store, where you can exchange your voucher (equal to the amount of your bike rental) for merchandise credit in the store — an excellent value. Select from a huge array of gear, shoes, clothing, accessories, snacks or drinks. You have three days to use your store credit, so there’s plenty of time to roam the vast aisles of the store for sports equipment and other goods from brands like Nike, The North Face, Ray-Ban and ASICS. Make a purchase while you're out on your bike ride, or come back later. If you make the popular bike ride across the Golden Gate Bridge to Sausalito, you can put your bike on the ferry for the journey back to San Francisco (own expense) to return your bike at the end of your rental period.